RUSSIA: President Vladimir Putin's love of sports means that, from a medical point of view, he is "much younger than his age," the Kremlin's chief doctor, Sergei Mironov, said in an interview published Monday. "He is a very sporty person. Not everyone at such a mature age starts to play hockey. He swims a lot. For him, swimming is one of his priorities and how he recovers his health and adapts to stressful situations," Mironov told the upcoming issue of Itogi magazine, a copy of which was obtained in advance of publication by RIA Novosti. 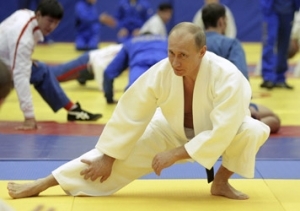 Putin, who will turn 61 in October, has striven to cultivate an action man image during his time in office. His love of sports and outdoor activities contrasts sharply with his predecessor, Boris Yeltsin, whose obvious physical decline when president was a source of embarrassment for many Russians. Mironov also said that Putin spends more hours in the air than most pilots because of his busy schedule, and that the president is skeptical about taking medicine, preferring traditional remedies including tea with honey, massages and visits to the banya, a Russian form of sauna. "From a medical point of view, Putin is significantly younger than his age," said Mironov. "His sporty way of life facilitates his great capacity for work." Russian officials are traditionally reluctant to discuss the health of the country's leaders. Yeltsin's health problems were repeatedly downplayed during the 1990s, and officials around the dying Brezhnev in the 1980s denied to the world that he was seriously ill.
Mironov warned that medical confidentiality restricted what facts could be released to the public. "I don't see the necessity of keeping information about the health of the head of state secret, but there are medical ethics," he said.